Few students are as integral to the artistic life of Bard College as Conor Brown, and certainly no student has been so involved in as many varied endeavors. Contemporaneous is happy to claim this voraciously versatile, remarkably omnivorous, and supremely dedicated dude as a member and thrilled to perform on the show he has fashioned to celebrate his creative work, which has earned him a position at the very top of each of his crafts here at Bard. This late-night show is sure to be an experience unlike any other, with seamless fusion of movement and music in which the audience plays a fundamental role. To miss this performance would be to miss out on a rising star who is unquestionably on his way to greatness. 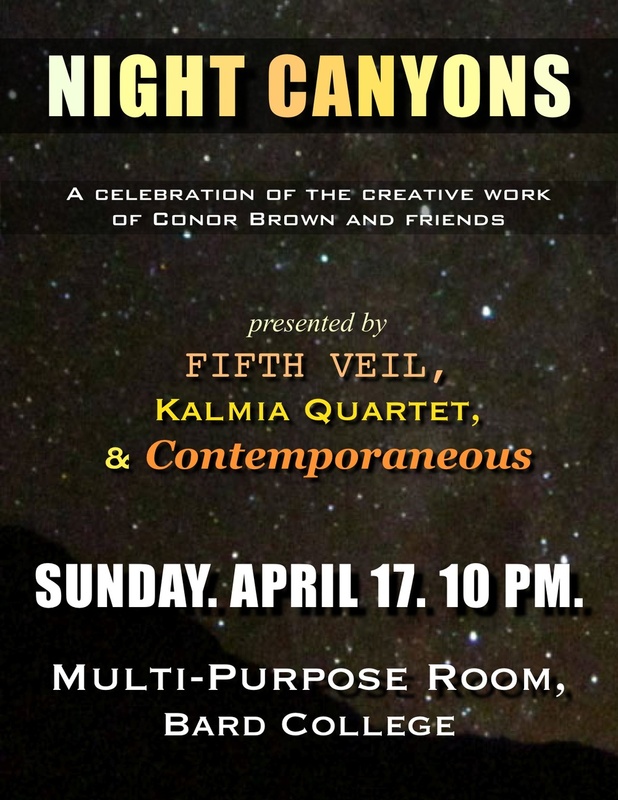 Conor Brown is a composer, choreographer, clarinetist, and dancer from Boulder, Colorado and currently studies at the Bard College Conservatory of Music with composers George Tsontakis, Joan Tower, and John Halle. Having received critical acclaim for a work commissioned and premiered by the Da Capo Chamber Players, the American Symphony Orchestra and soloist David Krakauer, a former teacher of Conor's, recently premiered his Clarinet Concerto. Conor has performed at Carnegie Hall, the Wordless Music Series, Interlochen Summer Arts, the Brevard Music Festival, and the Balkan Music and Dance Workshop at Mendocino, and has appeared on the radio on WNYC and From the Top. He is a founding member of post-rock/global folk band Fifth Veil and new music ensemble Contemporaneous. An alumnus of the Denver Young Artists Orchestra, he has been awarded a place on the roster of the Young Musician’s Foundation of Colorado. Fifth Veil channels a rugged mysticism. One moment, their music is expansive and otherworldly, the next, intimate and earthly. The listener travels to surprising sonic worlds: the band derives metal riffs from the odd-meters of Eastern European folk music, abstracts tight-knit vocal harmonies from medieval church choirs, and raises towering ridges of experimental rock. The luminous voice of lead singer John Boggs is a lantern... – follow it as a guide through dark wastelands, narrow canyons, and snowy mountain passes.